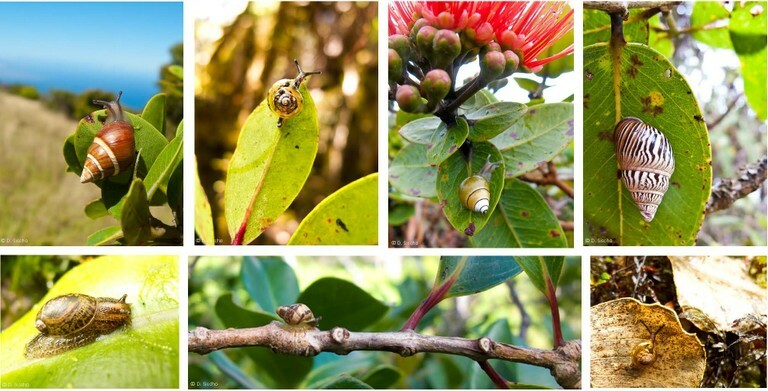 The Snail Extinction Prevention Program (SEP) was created to protect Hawai‘i’s imperiled snail fauna. The SEP Program, along with partner organizations, serves to monitor, provide predator abatement, and habitat protection for snail species currently facing extinction. Over 750 species of terrestrial snails were once described from the Hawaiian Islands, representing one of the most stunning examples of species radiations in the world. Sadly it is estimated that over 90% of this diversity has been lost. Why are Hawai’i’s snails going extinct? Habitat destruction from introduced ungulates such as pigs, goats, and deer degrade forest vegetation and fragment snail populations. 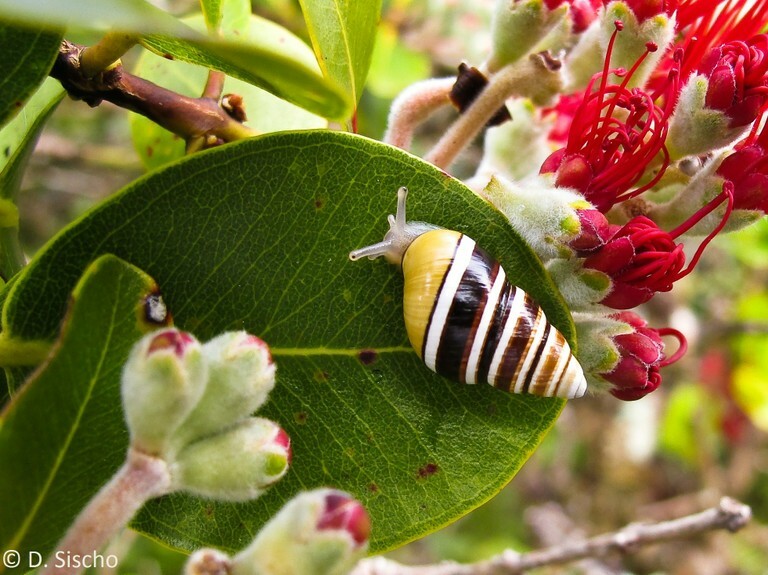 In addition, introduced predators such as rats, the predatory rosy wolf snail Euglandina rosea, and Jackson’s chameleons all depredate on Hawai‘i’s native snails. Having beautiful shells, Hawai‘i’s tree snails have been described as the “jewels of the forest”. Hawaiian folklore often depicts the tree snails as being able to sing. In fact there are over 30 pieces of traditional Hawaiian poetry that mention the kahuli or singing snails of Hawai‘i. These songs have now been attributed to tiny crickets that co-occur with the snails. Early naturalists were also enamored with the beauty of Hawaiian terrestrial snails, and their impressive species radiations, which influenced their ideas on evolution and island biogeography. Aside from their aesthetic appeal, cultural significance, and their scientific role in elucidating theories of evolution and island biogeography, Hawai‘i’s snails once made up a significant portion of the terrestrial fauna of the islands. Today their mere presence in an ecosystem may signify areas that are less impacted by introduced species and habitat destruction. Some species of terrestrial snails have been found to increase the nutrient cycling of forest litter, while other species may be beneficial to their host plants by feeding on fungus and algae that grow on leaves. Snails are a component of a functioning forest ecosystem, and are part of the natural and cultural heritage of the islands.